Subjects, styles, advertising, other relevant information: There is one local trade directory entry for Smee and Co in 1896. The only Smee, photographer, discovered with a Cambridge connection was Sidney C Smee b:1870 Cambridge, d:1924, who was a boarder in 1891 in Watford at 63 Gladstone Road, where he was listed as a photographer. In the Cambridge Independent Press 16 June 1899 - a Sidney C Smee, described as "a photographer" of 65 Jesus Lane Cambridge, gave evidence to Cambridge magistrates in a case about furious driving of a motor car (the defendant, Frederick William Lawrence, was allegedly driving at 10mph when he crashed into another vehicle). In 1898 the Cambridge Daily News reported that on the last day of a cycle show photographs were taken by Sidney Smee. There is no obvious trace of Sidney Smee in the 1901 or 1911 census returns. 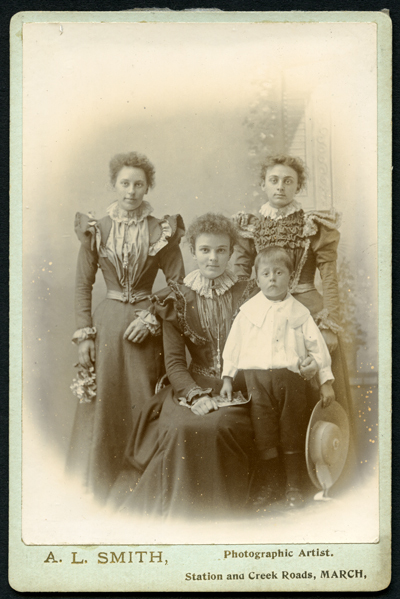 Subjects, styles, advertising, other relevant information: See below a cabinet photograph from the author's collection of a group of three young ladies and a boy, possibly wedding related as one lady holds a posy of flowers. The print is a carbon print with a very high gloss finish. The mount is very light grey with gold print on the face "A.L.Smith Photographic Artist Station and Creek Roads, March". The reverse of the mount is blank. This is the only trace found to date of this photographer. References: No trace of this photographer has been found in trade directories and no obvious matches yet found in the census returns. Subjects, styles, advertising, other relevant information: Beyond the directory entries nothing further has yet been discovered about this photographer. Subjects, styles, advertising, other relevant information: In the 1881 Census Emily was listed as a photographer's assistant, living at the above address with her husband and her parents. The head of the household was Emily's father Frederick Savage b: 1821, a shoe maker. Emily's husband was Arthur Smith b: 1853 Cambridge, a college servant. Also present in the household were: Emily's mother Caroline Savidge b:1822 Cambridge, and her cousin, Robert E Savidge b: 1864 Cambridge, a printer compositor, and a lodger. Subjects, styles, advertising, other relevant information: Son of a Cottenham market gardener, Frederick is listed in the 1901 and 1911 census at Margett Street Cottenham as a photographer working on his own account from home. His family comprised: father Thomas Smith b:1848 Cottenham, mother Caroline b:1848 Cottenham, sisters Florence Mary b:1879 Cottenham and Constance Eleanor b:1880 Cottenham. Between 1903 and 1905 Frederick submitted 10 photographs of Cottenham to Stationers' Hall for copyright purposes. These included photographs of the High Street, the Church, the Weslyan Chapel, The Philo and the Victoria Institute. TNA COPY 1/466/8, COPY 1/466/6, COPY 1/466/5, COPY 1/466/7, COPY 1/469/125, COPY 1/469/127, COPY 1/469/126, COPY 1/471/265,COPY 1/480/212, COPY 1/482/174. There is one portrait by F.J.Smith, of a group of seven young people, taken outdoors in a rural setting from the early 1900s on the Cottenham CCAN site at http://cottenham.ccan.co.uk/content/catalogue_item/mabel-moore-friends-possibly-male-family. No details are given of the mount or any text from the studio. Subjects, styles, advertising, other relevant information: John Smith lived in Cottenham. He was a musician, working from home on his own account in 1881, 1901 and 1911. However, in 1891 he was listed as a photographer working from home on his own account. In 1891 he was living with his wife Cecilia b: 1845 Cambridge, son George Smith, b:1871 Cambridge agricultural labourer, daughter Lottey Smith, b:1874 Cherryhinton, and son Tom Smith , b:1876, Cottenham agricultural labourer. References: England Census 1881, 1891, 1901, 1911. Subjects, styles, advertising, other relevant information: The 1881 census lists John J Smith, photographer b:1849 Banbury Oxfordshire living at 60 Eden Street, Cambridge. John was living there with his wife Eliza b: 1851 Newmarket and his sister, Mary Ann Smith b: 1856, Worsted Lodge Cambs, a butler's wife. In 1891 John was a photographer and caretaker (an employee) living at 6 Southwell Gardens, Brompton with his wife Eliza, a young niece and nephew and a visitor, Alice F Dellar b: 1862 Barrington Cambs, a lady of private means. By 1901 John's occupation was shown as a caretaker and was living with his wife, nephew and niece at 89 Cornwall Gardens, Brompton. Subjects, styles, advertising, other relevant information: This Lynn Road studio, originally opened by Valentine Blanchard, was later operated by John Hinley, then Alfred Drysdale. Lilian Ream started her photographic career as a young pupil of Alfred Drysdale. The studio was later taken over by Hardingham Mehew and then by Leonard Smith. Around 1909 Lilian Ream took over the Studio and Leonard Smith became the assistant. Subjects, styles, advertising, other relevant information: Philosopher, collector, scientist and early photographer in Wisbech taking photographs locally from 1852-1864, leaving a rich legacy of local views. Samuel Smith, calotype photographer / [by] Michael Millward and Brian Coe. Wisbech : The Authors, n.d. 8p., illus., photos., 21 cm. Samuel Smith was one of the photographers featured in the Cambridge Darkroom "Fen Archive 1850-1950" exhibition in 1986, see 1986 Cambridge Darkroom catalogue "Fen Archive 1850-1950" by Mark Lumley and Pavel Buchler. Subjects, styles, advertising, other relevant information: In the 1911 census William is listed as a hairdresser at 28 Upper Hill Street, Wisbech. He was the son of Samuel Smith, cuttler and grinder b:1839. 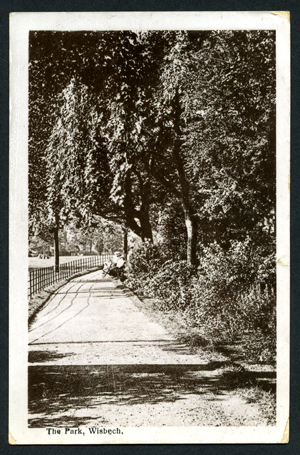 See below a real photograph postcard of The Park Wisbech. 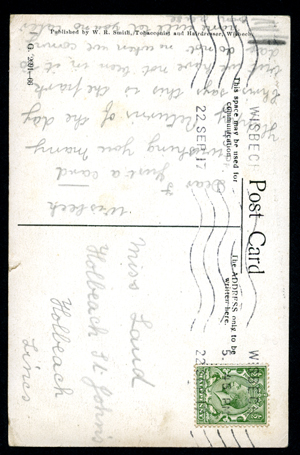 The card was postally used on 22 Sept 1917. The reverse of the card bears the words "Published by W.R.Smith, tobacconist and hairdresser, Wisbech. Not known if William took his own photographs or used those of other photographers. References: Not listed in local directories as a photographer. Subjects, styles, advertising, other relevant information: Keen amateur photographer with a special interest in urban landscape and architecture, and local Cambridge Solicitor. One of the founding Directors of the Cambridge Darkroom. Father of Timothy Soar, below. Took many photographs of the changing urban landscape of Cambridge in the 1970s and 1980s, most of which can now be found on Roy Hammans' website http://the-golden-fleece.co.uk/wp/ . Working Dates: c.1985-90 in Cambridge, still currently working elsewhere. Subjects, styles, advertising, other relevant information: Cambridge Yellow pages list his specialisms as: architectural, advertising, PR, Audio-visual, brochures, exhibitions. Subjects, styles, advertising, other relevant information: In the 1891 Census David Robert Spencely was listed at Main Street Littleport. The head of the household was his widowed mother, Lucy E Spencley b: 1836 Littleport, bookseller and stationer. David was shown as a photographer and picture frame maker. The family had a 16 year old live-in servant. Kellys Directory in 1896 carries an advertisement for David: "Photographer and picture frame maker: frames and local views: groups &c taken, distance no object; prices on application". (Kellys 1896). In the 1901 census David was again shown as a photographer and picture frame maker, working on own account from home. Home was still in Main Street Littleport where he was living with his widowed mother, Lucy E Spencely, book seller and stationer (an employer), his wife, Agnes Ellen Spencely b:1869 Littleport, and daughter Mabel K Spencely b:1897 Littleport. In addition to a servant the family also had living with them a 21 year old bookseller's assistant. In 1911 David was shown as a photographer, frame maker and tax collector, living at Main Street Littleport. He was living with his wife Agnes Ellen, assistant bookseller and stationer, and daughter Mabel Kathlene, who was shown as an assistant bookseller and stationer. David was also a postcard publisher and producer working in conjunction with local printer, William C Barber. Subjects, styles, advertising, other relevant information: In 1891 Albert was a single man, living as a lodger at 112 Elm Road, Kingston, the home of a gardener, Luke Rance, b:1853 Windlesham Surrey. The householder's son, also named Luke Rance, b:1878 Windlesham Surrey, although only 13 years of age, was also a photographer's assistant. In 1901 Albert was a lodger in Cambridge at 5 Garden Walk, Cambridge, and his occupation was shown as a photographic printer. In 1911 Albert was a photographic printer employed by others, living in George Street Cambridge with his wife Cecilia Florence Spivey b: 1880 Hersham Surrey and daughter, Lily Ada Spivey b: 1907 Cambridge. By 1939 Albert was listed as a photographer at 10 George Street Cambridge. He was living then with his wife, daughter Lily Ada and daughter Sybil b:1/11/1914. Subjects, styles, advertising, other relevant information: Son of a local chemist and druggist Samuel Sprigg b: 1803 Peterborough. In 1861 Henry was listed as a chemist and dentist at the Market Place, St Neots, having taken over his father's chemist business. In 1871 Henry was married with three children, two servants and an apprentice, living on the Market Square St Neots. He was listed as a dentist and chemist. Photography was apparently a secondary business interest. Henry advertised carte de visite portraits in 1856, later submitted topographical scenes to the St Neots Chronicle which reported favorably on his skills. Subjects, styles, advertising, other relevant information: In the 1861 census Richard was described as a joiner and artist living at Albert Place Peterborough. His wife Ann b:1814 Scotland was also an artist. Living with them were sons William b:1844 Peterborough and George b:1854 Peterborough and daughters Alice b:1851 and Ann Elizabeth b:1855. In 1871 Richard was listed as a joiner living at 10 Bread Street Peterborough. His wife Ann Spring was described as a photographer. Also living with them were George, Anne Elizabeth and grand-son David b:1866 Middlesex. Richard Spring was based at Peterborough, but he also travelled to sell his photographic services. David Bushby has documented his visit to St Neots in Dec 1854 and January 1855, and later to Kimbolton, in his article on St Neots photographers. Richard Spring also repaired accordians and concertinas, a fact which he included in his advertisements. Richard died in 1872 and Ann died in 1874. Heathcote, Bernard and Pauline, A Faithful Likeness - the first photographic studios in the British Isles 1841-1855, Heathcote, 2002. Subjects, styles, advertising, other relevant information: Photographer and upholsterer. William and his family were at 29 Corn Exchange Street Cambridge in the 1871 census. He was described as a photographer and frame maker. Also resident at the same address was William's wife, Sarah, their six children and his wife's brother, George Maynard, b.1846, who was described as a "photographer and french polisher". 1870 was a difficult year for William. In April 1870 there was a burglary at William's premises when a cash box containing £40 belonging to the Royal David Lodge of Ancient Shepherds, a Friendly Society, was stolen. In July there was a serious fire in the kitchen at his premises in Corn Exchange Street which might have consumed the entire premises but for a neighboring shop keeper acting promptly with an early form of fire extinguisher. By 1881 William was no longer a photographer. He had moved with his family to Northgate Road, Bury St Edmunds, Suffolk, where he was an upholsterer. 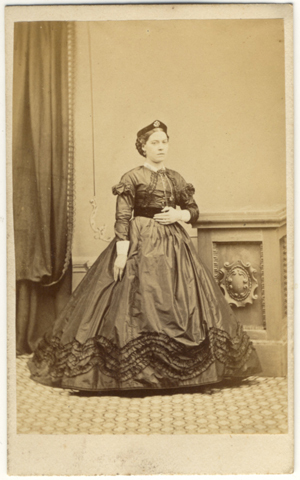 The example carte de visite below is from the late 1860s and is from the David Simkin collection. The mount has square corners. 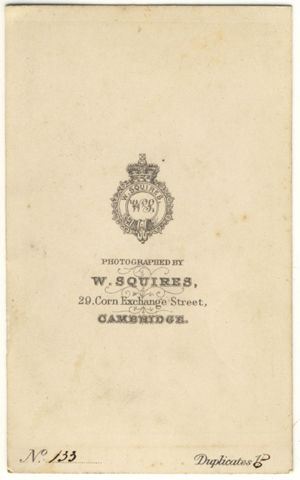 The reverse is a simple garter and crown "W Squires WS Photographed by W Squires 29 Corn Exchange Street, Cambridge". Burglary Cambridge Chronicle 30/4/1870. Fire at premises, Cambridge Chronicle 30/7/1870.